One of my colleagues recently told me about a new venue in Washington, DC, that she and her husband really like. But what really intrigued me was her description of the beverages they ordered, part of a series of drinks made for sharing (or in my case re-pouring, rather than re-making, each time the glass is empty). The venue, Provision No. 14, is located in a bustling NW DC area and they have created a menu of drinks that are made and served in coffee presses. Provision No. 14, I might also add, has a stunning interior and I understand the food is terrific. But back to coffee presses…. This seems like a brilliant idea (how did I not think of this already?? ), so I decided to try my own hand at the concept. I did some research and found a very limited number of recipes and inspiration online. In the end, I came up with my own concoctions based on ingredients available to me yesterday while doing a ManGrate video and photo shoot. Here are two summer drinks that will keep you sitting outside enjoying the warm weather for longer than a single-serve beverage allows. My coffee press holds 4 cups (32 ounces). Worth noting: You may want to let the mixtures sit in the press for a couple of minutes to allow the flavors to really meld. This should give you time to fill an ice bucket, grab the glass(es)—if you want to share—put on some tunes and head outdoors. Made with whiskey (or in my case, bourbon), hence the “mash” part of the name. 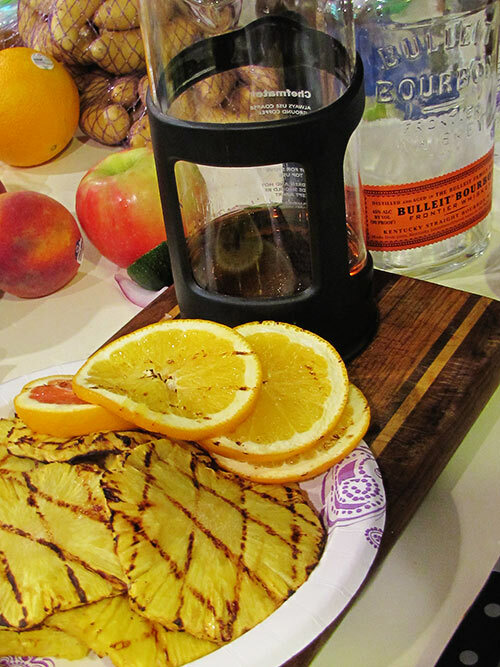 By utilizing the coffee press, you’re smashing the fruit, releasing great flavors. Place pineapple and orange slices on grill over medium heat. These only need to be on there about 2 minutes to bring out the juices (flip them once) and get a little bit of char. Rub the mint a little before placing into the coffee press, which releases some of the mint oil (or muddle in a glass with a pinch of sugar, then add). Don’t cut the mint, which could make the taste bitter. Slowly press the handle up and down a couple of times, finishing with the handle pushed all the way down. 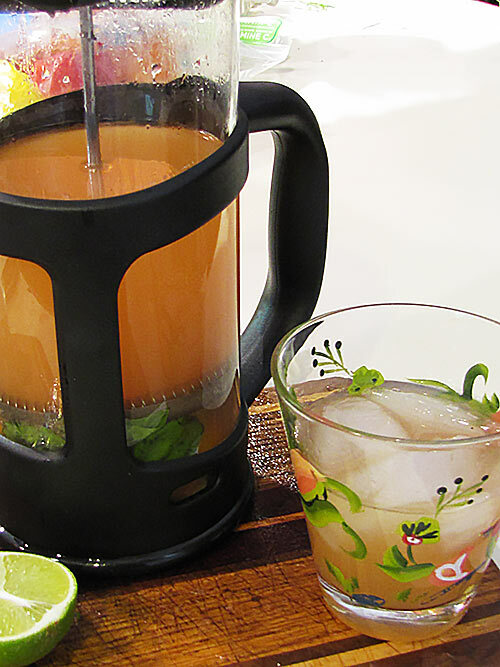 Pour over ice, garnish with mint leaves and enjoy! 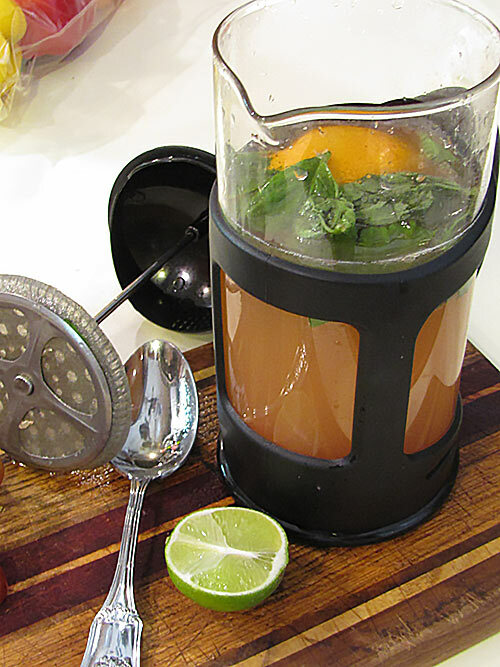 I’m typically not a fan of grapefruit but basil-infused simple syrup removes some of the “pucker factor.” The basil definitely complements the grapefruit, I might add. Rub the basil a little before placing into the coffee press, which releases some of the oil (or muddle in a glass with a pinch of sugar, then add). Roll the orange back and forth a few times on the counter (releases the juices), then cut it into slices and place into the coffee press with the rest of the ingredients. I squished the fruit a bit with my fingers to extract some of the juice further. Add the rest of the ingredients into the coffee press. Pour over ice. Garnish with a little more basil or an orange slice. *Basil-infused Simple Syrup: Place 1c water, 1c sugar and about 1c of chopped basil leaves into a saucepan and bring to a boil. Stir until all sugar is dissolved. Remove from heat and pour syrup through a fine sieve/strainer and into a container that has a lid—let it cool before covering. Syrup can be stored covered in the refrigerator for a week or so. 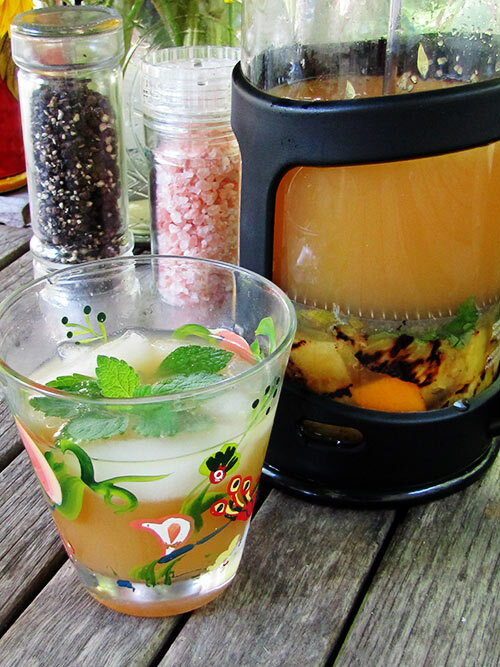 Perfect to add to iced tea or lemonade as well as drizzled over fresh fruit (strawberries, blueberries, pineapple…. ).